This document is to highlight an example setup for using tinc to create an IPv6 network. Click on the image for the original DIA file. IPv6 is provided via a native or tunnel-brokered service at a main site. If you need a tunnel, refer to Wikipedia’s list of IPv6 tunnel brokers. 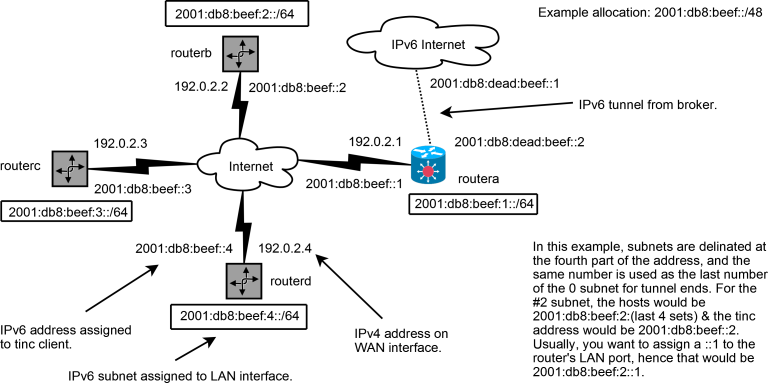 The IPv6 allocation given is 2001:db8:beef::/48, using a tunnel from 2001:db8:dead:beef::1 to 2001:db8:dead:beef::2. All the tinc connections share a subnet of 2001:db8:beef:0::/64, and their addresses are tied to 2001:db8:beef:(subnet #)::/64 allocations. For example, “routerc” will listen on tinc at 2001:db8:beef::3, will have a LAN address of 2001:db8:beef:3::1, and a subnet of 2001:db8:beef:3::/64. All the routers and servers using tinc connect over the IPv4 Internet, using WAN addresses based on 192.0.2.0/24. “routerc” uses 192.0.2.3. “routera” is a Linux server that manages the #1 subnet, and makes the connection to the IPv6 Internet. All other routers are assumed to be Linux based for their TUN/TAP support of bridged-Ethernet. On non Debian/Ubuntu systems, a line can be put in a boot script, such as ip -6 addr add 2001:db8:beef:1::1/64 dev eth1. IPv6 forwarding needs to be enabled: put echo "1" >/proc/sys/net/ipv6/conf/all/forwarding in a boot script, or net.ipv6.conf.all.forwarding = 1 in /etc/sysctl.conf. This setup uses tinc’s “switch” mode: subnets are not assigned in the host files; only Address (for ConnectTo targets only) and the key are required in host files. It is assumed that the config files go into something like /etc/tinc/link and /etc/tinc/nets.boot has an entry for “link”. The following table can be used to guide configuration of routers.